Volume 1 of the Mass Effect Library Edition has finally arrived! What is this, you ask? 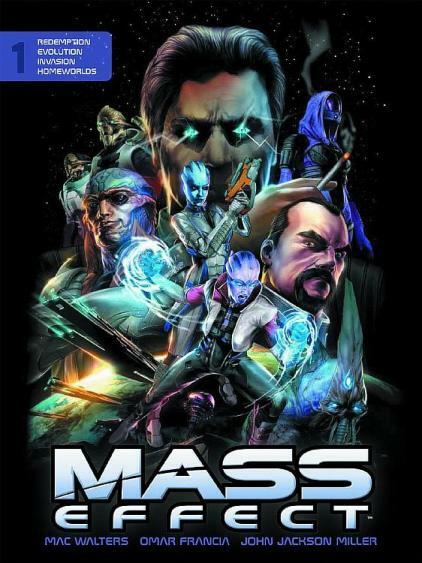 This hardcover book contains all four Mass Effect comic series, which includes Redemption, Evolution, Invasion, and Homeworlds, as well as the short stories from Dark Horse Presents, USAToday.com, and the Dark Horse digital store. Along with the comics, you get a running commentary from the writers and artists, as well as tons of art in the back of the book. Mac Walters, lead writer for Mass Effect 2 and Mass Effect 3 , also talks about what it takes to translate a video game world into a comic book world. The art is very well done and looks a lot like the game, but you can tell the artists let loose in some aspects, such as the colors of the Drell and the intricate beauty/ickyness of The Collectors. A lot of the female characters are over-sexualized, but they’re that way in the game as well, so I can’t complain too much. Aria’s badassery makes up for it. This collection is a must-have for any Mass Effect lover. I’ve heard some people say that not all of the series are good. I will say that this is worth it for the Aria, Liara, and Garrus issues alone, and for the knowledge that comes with the Illusive Man series. To put it into perspective, I already own all of these series, and yet there was still enough content in here to make it worth it to me. Do yourself a favor and grab it here from Dark Horse. Oooh! Okay, I don’t have money to spend but I need to find some stat so I can pick this up.